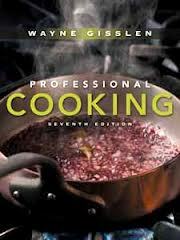 With its clear and effective approach to mastering basic skills and concepts through understanding and practice, Professional Cooking has earned a permanent place in the lives of millions of chefs whose careers it has helped launch. Wayne Gisslen's reputation for being able to simply, yet comprehensively, communicate information to beginning chefs is unsurpassed. · Analyze the nutritional content of ingredients and recipes. CulinarE-Companion also includes audio pronunciations and illustrated procedures for additional learning support. Once CulinarE-Companion is installed on your computer’s hard drive, it’s yours to keep and never expires! · Enhanced visual program with over 220 new color photos, including plated dishes, procedures, and products. · Approximately 100 new recipes, for a total of 650 recipes plus another 600 variations. · More focus on international recipes and variations. · Enhanced topical coverage on such things as: food science, molecular gastronomy, international recipes, and culinary math. · Chapter 10, Understanding Meats, now includes all information on meat fabrication in one convenient place.